Hai-Ting Chinn, Josh Rice, Eric F. Avery. Photo by Cory Weaver. Sometimes you are fortunate to have an extraordinary experience in the theater, when all the elements come together gloriously. I received such a blessing at The Scarlet Ibis, a new American opera that is part of the 2015 Prototype Festival and co-produced by Beth Morrison Projects and HERE. 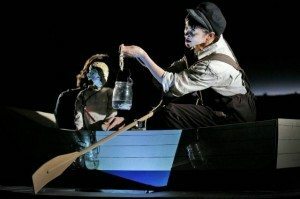 A magnificent collaboration between composer, librettist, director, designers, singers, musicians and puppeteers, The Scarlet Ibis is inspired by James Hurst’s well known short story first published in The Atlantic Monthly in 1960. Composer Stefan Weisman and librettist David Cote have crafted an achingly beautiful opera examining the complex relationship between two brothers, the younger one born disabled, otherworldly and nicknamed Doodle and the older one, known as Brother who just wants a normal brother. Tinged with Southern Gothic imagery and set a hundred years ago in rural North Carolina, the story centers around Brother’s self-improvement plan for Doodle, motivated by a potent mixture of love for and shame of his crippled brother. As the story unfolds, a summer storm brings a scarlet ibis to a final landing in the family’s yard, becoming a significant symbol for both brothers. In the original short story, Brother is the narrator and “time has had its way”, but Mr. Cote has wisely given the narrative a compelling “here and now” immediacy, imbuing the libretto with dramatic discoveries. Mr. Weisman’s music is profoundly connected to the emotional life of the characters, including the melodic simplicity of a hymn and the harmonic and rhythmic density of a storm at the climax of the story. The final haunting melody, pulsating with the beat of a grief stricken heart, brought tears to my eyes. Hai-Ting Chinn. Photo by Cory Weaver. Every artist involved with this production should be congratulated for their stunning work. Hai-Ting Chinn in the role of Brother, sings with tremendous conviction, creating an unforgettable character with her versatile mezzo soprano voice. Blurring the lines between singing and acting, she gives the older brother an incredible believability. 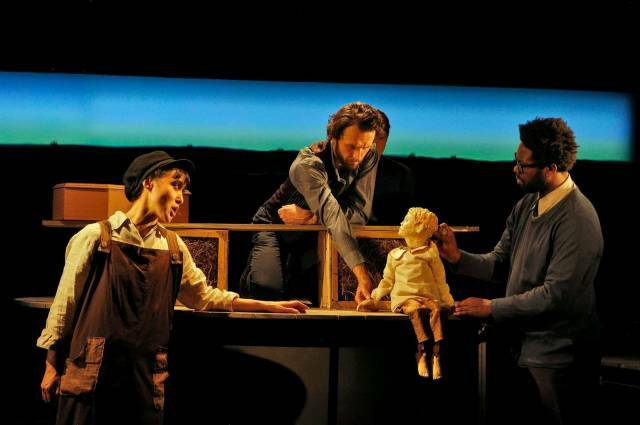 Doodle is a collaborative tour de force, merging the amazing vocal talents of countertenor Eric S. Brenner, the artistry of puppeteers Eric F. Avery, Josh Rice and Meghan Williams and puppet designer Tom Lee. Mr. Brenner’s voice shimmers with ethereal sounds, reminding us of how fragile the struggle to survive is when one is different. Mother and Father, played by Abigail Fischer and Keith Phares, give nuanced and heartfelt performances as parents trying to cope with a special child. Contralto Nicole Mitchell, in addition to a warm portrayal, with touches of humor in the role of Auntie, possesses a superb and remarkable voice. The Scarlet Ibis is exquisitely directed by Mallory Catlett; she transforms the space from house interiors to the terrible beauty of the swamp, imaginatively using the multi leveled moveable platforms brilliantly designed by Joseph Silovsky. Musical director Steven Osgood and a first rate ensemble of musicians known as the American Modern Ensemble played Mr. Weisman’s score with sensitivity and many musical shadings. Opera lovers owe a big debt of gratitude to Beth Morrison Projects and HERE for supporting and nurturing such vital new work. Contemporary opera/music/theater is alive and well at the Prototype Festival!